This is no doubt a lovely suit. As soon as I received it, I steamed it and put on the entire ensemble. Tennant tie, linen shirt and of course the Converse. Everything fits quite well. My brother was surprised at how nice this suit looks. 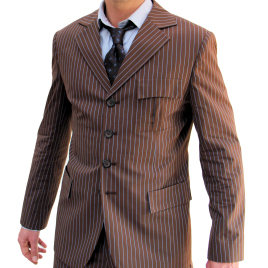 Just know that it will wrinkle easy and that is part of the charm of this suit. One small thing I would say that is not kosher would be the sewing around the second button hole came undone a bit. Not a huge problem and is a fixable one. Other than that, yea. I'm wearing my suit right now and it feels fantastic. Quite brilliant. I look forward to wearing this suit. WANT TO GET UPDATES FROM MAGNOLI CLOTHIERS? Magnoli Clothiers is dedicated to the reproduction of vintage clothing, historic garments and popular film costumes. These reproductions, however, are not costume pieces, but tailor-made, high-quality clothing. Copyright © 2019 Magnoli Clothiers All Rights Reserved.